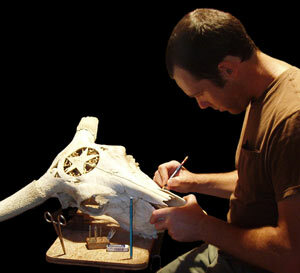 Seth O'Hara Bellamy crafting the detail of his famous osteology skulls from Dallas, Texas studio. S.O.B. Skulls Co., is a growing business as fast as the dental tools will etch. The word horn has long been used imprecisely to describe any protuberance from the skull of an animal, real or imaginary, whatever its actual composition. But for our purposes the word 'horn' is restricted to the keratinous tissue which covers a bony core on the heads of Texas Longhorn bovine. It forms in laminated layers separated by connective tissue and grows throughout the life of the animal. The natural colors of horn range in the various tones of associated hair. The laminar structure also produces longitudinal striations of multiple colors made prominent by rubbing, sanding, and or polishing. Horn is the natural plastic of the pre-industrial age. Since Antiquity the medium has been uniquely versatile. Across the globe, this important byproduct of the food and tanning industries had been used simultaneously both in the manufacture of the most basic utilitarian objects, from buttons to combs, and also in the creation of objects from swords to armor to drinking cups. The Bible, KJV 1611, records the word horn or horns 101 times due to the many illustrations using the horn or types of horn power. The Bible also refers to inkhorns used by scribes and those of letters. Champion Show steer Lawman was immortalized with this professionally polished skull which measures 85.5" tip to tip and is offered by the Longhorns Head to Tail Store for $3200. This is the 26 step process with detachable horn shells for safe shipping. The modern high value of a prime quality steak has caused the spotlight of focus to turn a blind eye from the byproducts of bone and horn. Plastic products by the Chinese boat load have taken the place of every horn or bone tool of history, yet those artistic collectors and appreciators of the historic crafts still savor handmade beauty not found at the local Walmart. This nine inch Texas Longhorn horn handle knife is designed by Championship knife craftsman Rod Watts of Hot Springs, SD. Knife handles of horn have been around for thousands of years, but not with this modern artistic style. Price $600. Rod Watts of Hot Springs, South Dakota is a national award winning knife craftsman. His collector sought-after hand made knives are famous for his careful detail designs made of mammoth tooth, fossil coral, stag, mammoth ivory, micarta, giraffe leg bone, camel leg bone and now with the new models, Texas Longhorn horn. 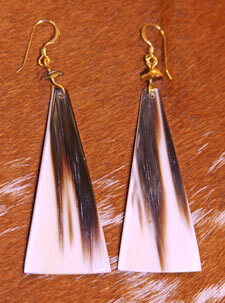 Watts likes the durability and richness of the transparent horn colors from the multicolored Texas Longhorn. See the highly valuable Watts horn-handle knives packing a piece of Texas Longhorn at the Lone Star Knife Expo, Ft. Worth, the New York Custom Knife Show, and Professional Knife Makers show in Denver. Texas Longhorn cattle are valuable on the inside due to their high omega 3, lean healthy beef. However, they are the most valued breed of cattle in the nation for the appendages on the outside. 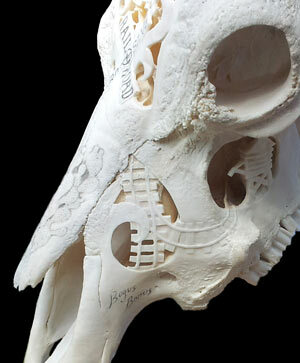 The often criticized and overlooked horner and osteology parts have artistic and collector values still to be discovered and well beyond salvage meat prices. Horn ear rings come in over 100 shapes, sizes and styles to fit any attire. Bangles horn necklaces and bracelets are also hand made by Joel Dickinson available from the Longhorns Head to Tail Store. Joel Dickinson of Barnesville, Ohio has worked with bleaching, polishing and boiling skulls since his dad forced him to work the horn cooking tank as a child. Seldom does anyone enjoy the different "aromas" of boiling steer parts so it is not a natural thing that the whole world wants to get involved. For years Joel and his brother Kirk have developed a 'somewhat secretive' 26 step process of producing polished skulls believed to be the finest in technique. The process is not without careful hand work and hours of boiling. Evolving from polished skulls, which are shipped all over the world, their Longhorns Head to Tails Store offers mounted taxidermy steer shoulder mounts, mounted steer tails, tanned hides, hoof lamps, blowing horns, powder horns and a wide range of over 100 styles of horn jewelry. Colorful ear rings, bracelets and necklaces come in all the various polished horn colors to coordinate with any formal attire. The store Horn Gallery displays over 500 types and styles of western horn decor or evening ware. SOB Skulls is the art of Seth O'Hara Bellamy of Dallas, Texas. Seth is all about serious detailed osteology of the Texas Longhorn. Seth drilled his way into the skull decor business in a big way starting with the inheritance of his grandfather's dental drill tools. He has taken the sale of highly intricate skulls to a higher notch -- the price just went up again, and he worked for it. His detail amazes any seasoned sculptor. This close-up detail shows the brilliant artistic pride Seth O'Hara Bellamy applies to every piece of his developing osteology craft. Seth started his carving skills with gun stocks, then it happened. While working on a hardwood stock he eyed an old cow skull in his mother's flower garden. Putting the thought together while the dental drill was in hand, Seth decided if it would drill tooth enamel it would drill a cow skull. After a college try and some hit and miss education, people who saw his new skill were excited at the outcome. It was a new decor -- a look never before created. Seth was fascinated by the designs that came from the original concept of each skull and the visual beneath the exterior surface bones. It was lacy butterfly sinus cavities and original anatomy structures totally hidden until his artistic tiny drills opened it up to view. It was like a natural filigree with every cavity totally different. The microscopic designs would be nearly impossible to develop, yet with the new technique of the dental tools all it needed was discovering. Seth's hobby morphed into a nice income producing business when he took two sculptured skulls to the Dallas Gun Show. After selling his "learning" skulls he started taking orders for custom designs. Sometimes he furnishes the Texas Longhorn skulls and others use special skulls from favorite cattle for his intricate craft. A new niche market for a new product was developed. With each work of art new concepts have evolved. 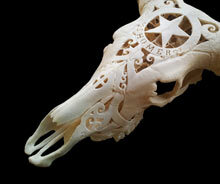 His marriage to bone, horn and the Texas Longhorn is a work of love and great dedicated skill. In a world of beef cattle and rugged cowboys of the western range, steak is the prime target. Yet in a new niche market world the Texas Longhorn offers originality, history, absolute beauty and some serious values never before explored. Leave it to Texas Longhorns to create a profit trail for drovers old and new!